A dazzling .55 carat F color, Vs2 clarity marquise cut diamond is the focus of this spectacular antique style engagement ring. The fiery diamond rises above a wide, richly filigreed band. 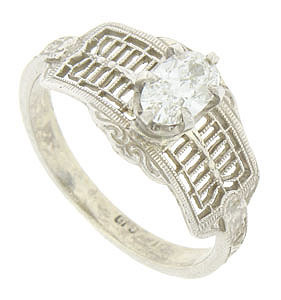 Scalloped flourishes decorate the top and bottom of the filigree. 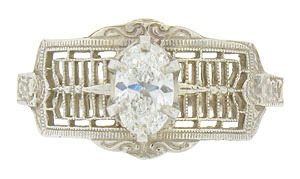 The sides of the wedding ring are decorated in a repeating pattern of twisting ribbons and full figured blooms. 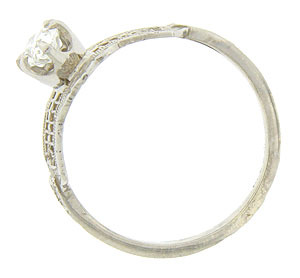 Crafted of 14K white gold, the ring measures 10.26 mm. Size 7 1/4. We can re-size.